Emmett Atwater thought Babel's game sounded easy. Get points. Get paid. Go home. But it didn't take long for him to learn that Babel's competition was full of broken promises, none darker or more damaging than the final one. Now Emmett and the rest of the Genesis survivors must rally and forge their own path through a dangerous new world. Their mission from Babel is simple: extract nyxia, the most valuable material in the universe, and win over the indigenous Adamite population. But Emmett and the others quickly realize they are caught between two powerful forces--Babel and the Adamites--with clashing agendas. Will the Genesis team make it out alive? Scott Reintgen has spent his career teaching English and Creative Writing in diverse urban communities in the United States. The hardest lesson he learned was that inspiration isn't equally accessible for everyone. So he set out to write a novel for the front-row sleepers and back-row dreamers of his classrooms. He hopes that his former students see themselves, vibrant and on the page, in characters like Emmett. 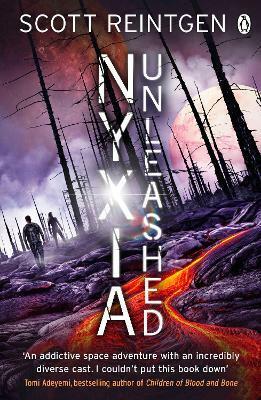 Nyxia and Nyxia Unleashed are the first two novels in The Nyxia Triad. You can follow Scott on Facebook, on Instagram and on Twitter at @Scott_Thought.